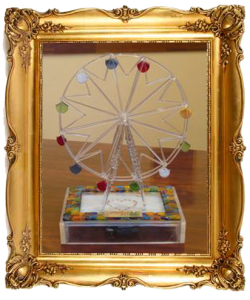 Contest «CRYSTAL WHEEL» were determined! Theme Park "DINO and I" brings together in a single covered area (2700 sq. m.) the most popular children's rides and simulators, playgrounds and multi-level children mazes, mini bowling, and a family café and a party zone. The center of attraction is show of animatronic dinosaurs, and musical orchestra made by EEC. All decorations was made by EEC. Secret remained until the Ceremony of awarding the Winners - 30 September 2016! 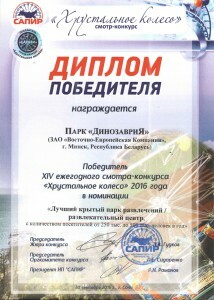 The award ceremony was held in the framework of the Forum of professionals of entertainment industry and recreation in Sochi. Every year competition is held with the aim of identifying and disseminating best positive experience of different directions of the Park activities and the high quality standards of services in the field of recreation and family entertainment! «CRYSTAL WHEEL» it is the ONLY Russian and CIS industry competition among enterprises and professionals of the entertainment industry.